This quaint Kate Spade Metro watch exudes whimsical beauty. 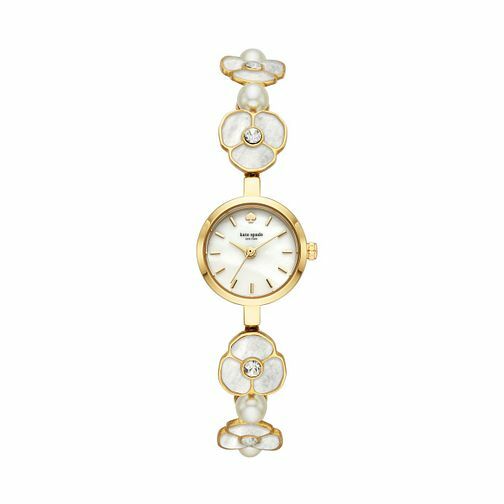 Undeniably feminine this watch is sure to be a vision of beauty when worn on the wrist. The stunning floral motifs along the strap are delicately encrusted with a single crystal adding some understated glamour to the unique design. The mother of pearl dial, features the slender gold tone hands and is embossed with brand logo, the design is completed with the opulent gold tone of the dial frame. Welcome to the world of Kate Spade. Quick, curious, playful confident and strong.